Steve and Fancy began dancing shag together in 2009. Soon after winning their first Camp Hollywood shag competition in 2010 they began teaching and building the shag scene in LA and southern California. Together they worked on creating new moves and patterns that have become standard for shag dancers all over the world. Based in Gloucestershire, Jim & Nicky have been teaching Swing Dancing on a weekly basis for over 20 years. Collegiate Shag is their passion and have made the dance their speciality, teaching weekly shag classes in Gloucestershire as well as teaching at many of the dance camps in the UK including Hullzapoppin, Hepcats Holiday, Rock Bottoms, Jumping at the Woodside to name but a few and have been familiar faces on the teachers line up at Twinwood. Jim and Nicky are well known for their fun and relaxed style of teaching. Peter and Aila love exploring the wide range of music, styling, and speeds and moves that Shag enables. Their deep knowledge and passion for the dance has taken them teaching, performing, and DJing for shagsters all over the UK and Europe. The duo have been dancing Shag and other swing dances for over 10 years. Peter set up London's ‘Shag Pile’ after running an unofficial week of Shag in Herrang. The group exists to grow the local scene through high quality weekly classes, workshops and events. As a performer, he has danced in films including ‘Gambit’, ‘Me and Orson Welles’ and ‘Avengers 2’. Aila’s professional dance experience and training bring a solid and technical knowledge to her teaching. She is artistic director and choreographer of the internationally renowned flapper troupe 'The Bee’s Knees' and leads Shag Pile's performance troupe - The Shag Pilots! 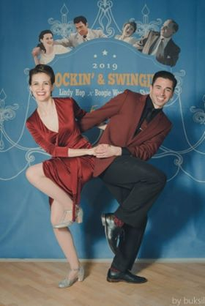 Rebecca and Adam's Shag journey started with a chance encounter at University of Swing 2015 - after spotting another couple doing this crazy dance they were hooked, and since then have pushed themselves to master as much as they can! Despite being relative newcomers to the scene, they've already been punching above their weight, placing at Glasgow Shag Festival in the Intermediate J&J 2016, Advanced J&J 2017, and the Open J&J at Barcelona 2016 (where they also made the finals in the strictly)! Their philosophy emphasises musicality and improvisation built upon technique-driven foundations. In class they focus on the real nitty gritty concepts that make up the dance, and use them to unlock limitless possibilities for even the newest of dancers. ©Copyright 2019 Glasgow Jitterbugs. All rights reserved.